Check JSET Physics Results @jest.org.in for 2019 held on 17th February, 2019. 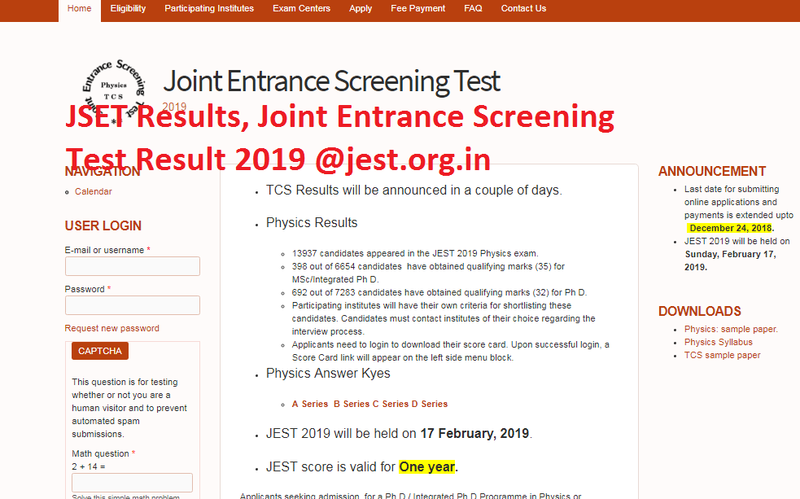 Declaration date for JSET Results, Joint Entrance Screening Test 2019 is 8th March, 2019. Students can check the result and marks scored in JSET Physics, TCS (Joint Entrance Screening Test 1, 2) Exam here by clicking on below mentioned link. TCS Results will be announced in a couple of days. 13937 candidates appeared in the JEST 2019 Physics exam. 398 out of 6654 candidates have obtained qualifying marks (35) for MSc/Integrated Ph D.
692 out of 7283 candidates have obtained qualifying marks (32) for Ph D.
Participating institutes will have their own criteria for shortlisting these candidates. Candidates must contact institutes of their choice regarding the interview process. Applicants need to login to download their score card. Upon successful login, a Score Card link will appear on the left side menu block. Open the official direct link given above for website of JSET Results 2019 Exam. Applicants need to login to download their score card. Upon successful login, a Score Card link will appear on the left side menu block. IIA Indian Institute of Astrophysics, Bangalore: Astronomy and Astrophysics, Astronomical Instrumentation, Optics, and Atomic Physics. IISER THIRUVANANTHAPURAM Indian Institute of Science Education and Research, Thiruvananthapuram: Experimental: Magnetism, Superconductivity, Nanoscience, Photonics, Semiconductor physics, Surface sciences, Nanoscale plasmonics, Ultrafast spectroscopy, Nonlinear Optics. Theory: Cosmology, Quantum information, Statistical physics, Condensed matter, String theory & Nonlinear dynamics. IOP Institute of Physics, Bhubaneswar: Physics (Condensed Matter, Nuclear and High Energy Physics) and Accelerator-based Research. IPR Institute for Plasma Research, Gandhinagar: Physics (Experimental and Theoretical). IUCAA Inter-University Centre for Astronomy and Astrophysics, Pune: Physics, Astronomy and Astrophysics. NCRA-TIFR National Centre for Radio Astrophysics, TIFR, Pune:Astronomy and Astrophysics. Raja Ramanna Centre for Advanced Technology, Indore:Lasers and their Applications, Laser Plasma Interaction, Cold Atom Physics, Condensed Matter Physics (Superconductivity and Magnetism, Crystals and Thin Films), Nanomaterials and Applications, Non-linear and Ultrafast Optical Studies, Beam Physics, and Free Electron Laser. UGC-DAE Consortium for Scientific Research, Indore:Surfaces, Interfaces, Thin Films and Nanomaterials, Physics at Low Temperatures and High Magnetic Fields, X-ray, Optical and Electron Spectroscopic Studies Using Synchrotron and Laboratory Sources; Electrical, Magnetic and Thermal Properties of Condensed Matter; Condensed Matter studies using Magnetic Neutron Diffraction, Nuclear Technique Based Condensed Matter Physics-Positron Annihilation Spectroscopy, Mossbauer Spectroscopy, Experimental Nuclear Physics, Gamma Ray Spectroscopy of Nuclear High Spin States, and Nuclear Reactions. JEST will be held at the locations indicated below. Please see the websites/advertisements of the participating institutes for their eligibility criteria in details. Listed below are tentative eligibility criteria of admission to M.Sc, Ph.D, and Integrated / M.Sc / M.Tech. – Ph.D programs in the participating institutes. MSc in Physics, Engineering Physics or Applied Physics will also be considered atIPR. M.Sc./ M.E. / M.Tech. ​/ MCA ​in any engineering or science discipline, with good mathematical skills and strong interest in biological problems. B. Sc. (Physics / Mathematics) / B.E. / B.Tec. will be considered for Integrated M.Sc – PhD at Bose Institute. An Application Fee of Rs. 300 (Rs 150 for SC/ST applicants, Rs.150/- for Female applicants) is required to be paid along with the application which can be paid online. Application fee is waived for Female applicants belonging to SC/ST.